Low carb spaghetti squash lasagna boats with meat are easy & delicious! 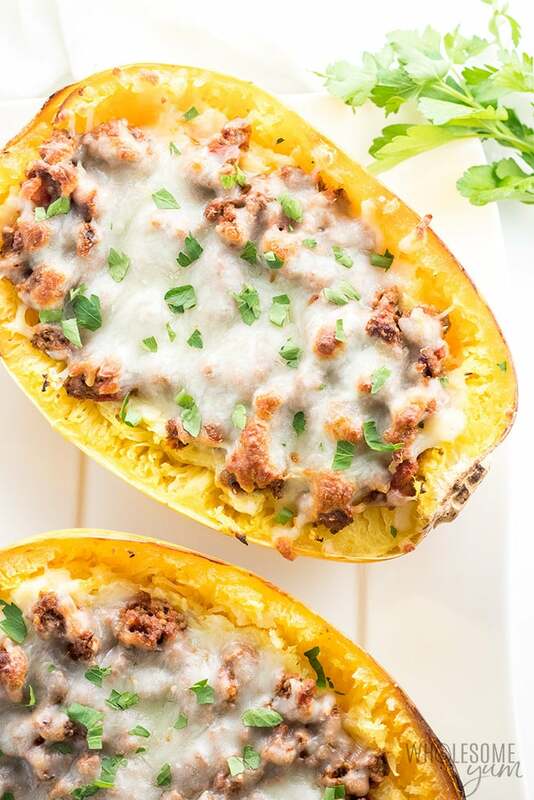 This lasagna stuffed spaghetti squash recipe is healthy comfort food in one meal. It’s getting close to the end of January. Are you still sticking to your resolutions? 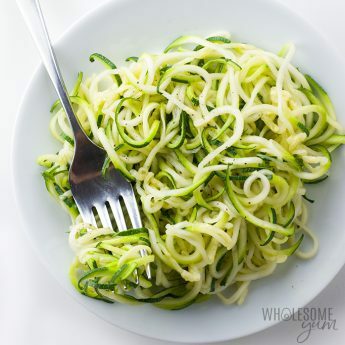 If you’re tempted to waver – or if you’re just looking for healthy meals that taste great – low carb comfort food recipes can really help. 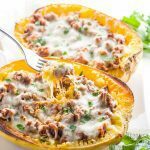 Like these low carb stuffed spaghetti squash lasagna boats. 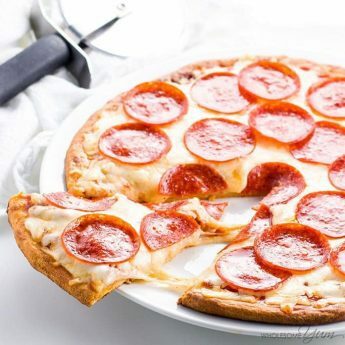 I’m a huge fan of keto comfort food. And, it doesn’t get any better than the Italian flavors of lasagna. That’s why eggplant lasagna and lasagna stuffed peppers make regular appearances at our house. They are e-a-s-y and the whole family loves them. 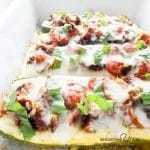 These low carb spaghetti squash lasagna boats came about like many of my recipes. I had ingredients I needed to use up. And, I was looking for more ways to enjoy the flavors of lasagna. 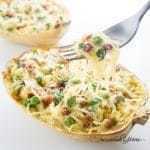 Lasagna stuffed spaghetti squash is a great recipe to make unplanned. All the ingredients are common. You can find them at any grocery store. In fact, I often just have everything I need at home at any given time. Hooray for spur-of-the-moment dinners! You just wouldn’t expect the result to be as delicious as spaghetti squash lasagna, right? The list of ingredients may seem a little long on the recipe card, but don’t let it deter you. That’s only because we repeat some of the ingredients. As always, we’re sticking with ten ingredients or less. 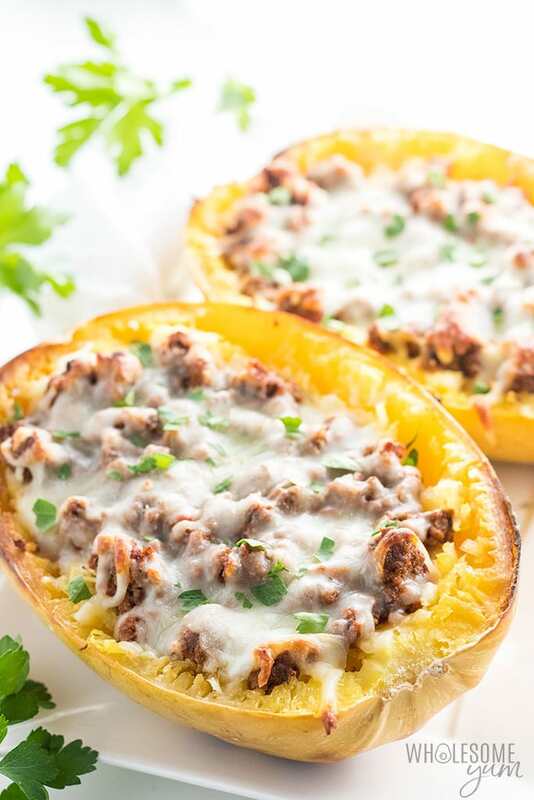 All you need for this Italian lasagna stuffed spaghetti squash recipe is olive oil, sea salt, black pepper, garlic, ground beef, marinara sauce, Italian seasoning, and three cheeses. Like most lasagna recipes, the cheeses are ricotta, parmesan, and mozzarella. But, if you have something else you want to use, why not? That’s usually the only ingredient I need to run out and get when I need to make this recipe. But the first time, it was the squash in my pantry that prompted me to make it. 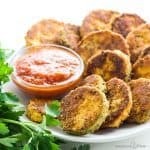 Watch for added sugar or fillers in the marinara sauce and Italian seasoning. I like this sauce and this seasoning if ordering online. You can easily find ones without weird stuff at the store, too. Otherwise, it’s not complicated to make them yourself at home, if you have the time. Spaghetti squash lasagna boats have three layers. These include cheesy parmesan ricotta spaghetti squash, beef marinara, and melted mozzarella. I was undecided about keeping the spaghetti squash strands separate versus mixing them in with the parmesan and ricotta. I tried both ways, but it tastes better when the spaghetti squash layer is cheesy. Feel free to keep them separate if you prefer. If you do, you’ll want to add more salt to the strands. Then, layer the ricotta and parmesan mixture on top. The best part about this low carb spaghetti squash lasagna with meat is that you can prepare the layers in advance. Simply make each layer according to the instructions, and store in glass containers in the fridge. 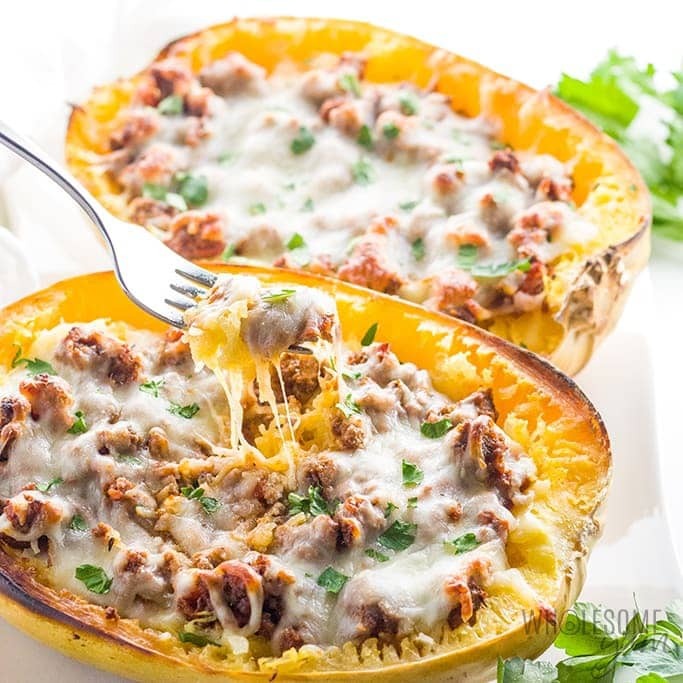 When you are ready to serve, assemble the spaghetti squash boats and heat in the oven. You could also do the assembly ahead of time if you wanted to. But, the downside is that the marinara may seep through the multiple layers. It would still probably taste fine, though. The steps for how to make spaghetti squash lasagna boats are very simple. Don’t be put off by the number of them! Everything is very straightforward. And, you can prepare multiple layers in parallel to save time. Start by roasting the spaghetti squash in the oven. I use a higher temperature to do it faster, and you can find instructions for instructions for how to bake spaghetti squash here. Meanwhile, saute the garlic in a little oil. Add the ground beef, season with salt and pepper, and cook until browned. Once the beef is cooked through, add the marinara and seasoning. Simmer everything together. You can make the cheesy layer at the same time, too. Stir together the ricotta, parmesan and a little olive oil in a large bowl. You’ll add the spaghetti squash to it later, so make sure there is enough room. Finally, all that’s left is the assembly of your stuffed spaghetti squash lasagna with meat. To start, mix the squash strands into the bowl with the cheeses. Now, just alternate the layers inside the empty shells – spaghetti squash, beef marinara, and mozzarella. You can do just one layer of each to keep it simple, or multiple thin layers if you want that layered aspect of lasagna. You’re probably not too surprised that I usually do it the easy way! Place the assembled spaghetti squash lasagna boats into the oven to melt the cheese. It’s up to you how much you want it to brown. I sprinkled with a little parsley at the end for color, but that’s totally optional. 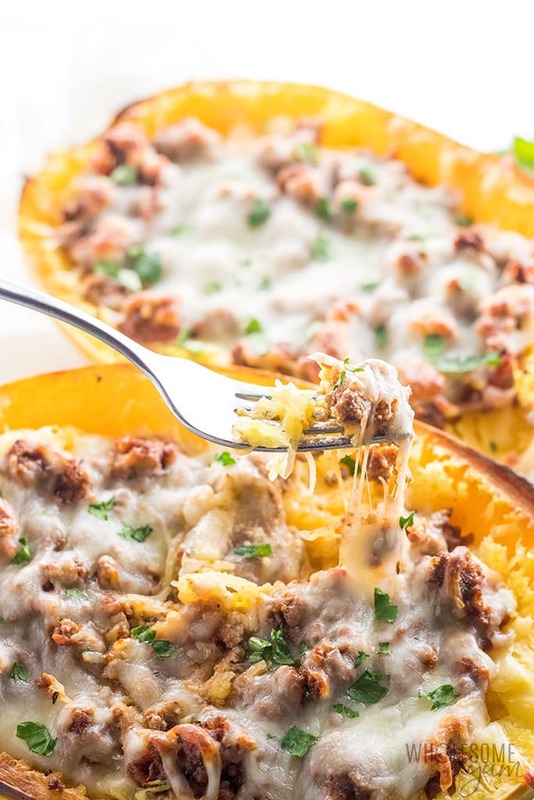 There you go – easy, low carb lasagna stuffed spaghetti squash! Cook the spaghetti squash in the oven at 425 degrees F (218 degrees C), according to the instructions here. Meanwhile, heat the remaining tablespoon of oil in a large pan over medium-high heat. Add the garlic and cook for about 30 seconds, until fragrant. Add the ground beef. Season with sea salt and black pepper. Cook until browned (about 10 minutes), breaking apart the meat with a spoon or spatula. Stir in marinara sauce and Italian seasoning. Reduce heat to a gentle simmer. Simmer for about 10 minutes. If it's done before the squash is ready, cover to keep warm. Meanwhile, stir together the ricotta cheese, parmesan cheese, and a tablespoon olive oil in a large bowl. (The bowl should be large enough to add the spaghetti squash strands later.) Set aside. When the spaghetti squash is done cooking, take it out of the oven, but leave it on at 425 degrees F (218 degrees C). Cut the squash in half lengthwise (if you cooked it whole and it is not cut yet). Place open side up onto the baking pan and use a fork to release strands. Transfer the spaghetti squash strands into the large bowl with the ricotta and parmesan cheeses. Mix together. Season with sea salt to taste. Return the lasagna spaghetti squash boats to the oven for about 10 minutes, until the cheese melts. Cook time above assumes the faster way of cooking the spaghetti squash (cut in half), and cooking the ground beef in parallel. Click or tap on the image below to play the video. It's the easiest way to learn how to make Spaghetti Squash Lasagna Boats! This is just what I needed right now – hearty, satisfying and healthy! This recipe is misleading. 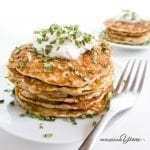 If you eat this according to the recipe you must multiply the nutritional info by 3.5, which makes this over 25 g. Carbs. I was disappointed once I read further. Doubtful that I will devote the time to such a high carb dish. Hi Lauree, I’m not sure why you would multiply nutrition info by 3.5? A serving is 1 cup, and the recipe makes 7 servings. We’ve been making this recipe and loving it, thank you! This was such an amazing recipe, I think I finally got my family convinced on spaghetti squash! Thank you for this amazing meal! 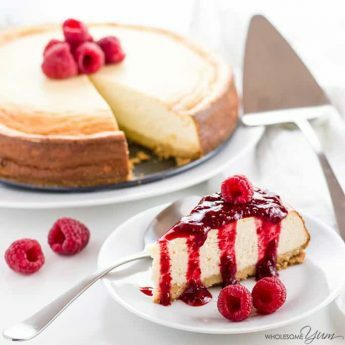 Thanks so much for posting this delicious recipe! I made it once and enjoyed it, and have been tweaking it to make it just right for my family. I posted my own version on my new website today. Thanks for the inspiration! 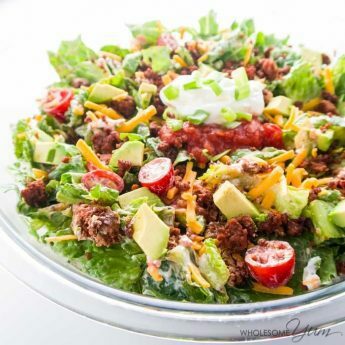 I made it vegetarian using vegetarian meat crumbles – so yummy it’s been barely a week and we’re having it again because it was sooo good the first time! Our squashes were pretty small so it didn’t make as many servings, but no biggie. 🙂 can’t recommend it enough!! Made this last night…sooooo good! I think it is even better the next day!!! 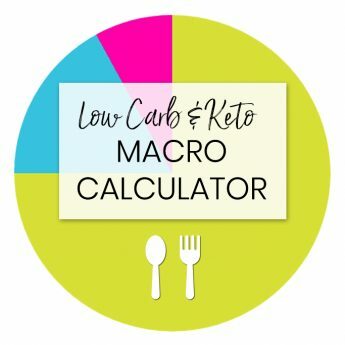 I love delicious low carb meals! This is a great one and a definite favorite! Thank you for the delicious recipe! My family loved it and we’re planning to make it again! Made this for dinner and it was amazing. But I instead of ground beef I used spicy Italian sausage and still added the same amount of ingredients in the recipe. Very tasty with extra spicy kick to it. I will definitely make this again. I love to hear that, Irene! Thanks for stopping by! Glad to hear that, Lorraine! Hope you liked it! I am so happy you liked them, Eunice! Please come back again soon! First, I have to say that this was my first time cooking spaghetti squash, but your directions were spot on, so thank you! I had no idea how much one would make, lol! I made two, thinking that one wouldn’t be enough for my family of four… Boy was I wrong! One squash produces SO. MUCH. FOOD. Now, onto the recipe… This lasagna is AMAZING!! My entire family devoured it, especially my 16 year old. He had 3 bowls for dinner and ate the rest for lunch the next day. Thank you for taking the time to perfect these recipes and share them with us. I look forward to trying many more of them! I am so happy your whole family liked it, Jess! Thanks for stopping by! Yay! So happy you and your husband liked them, Nik! How much is the nutritional value for just the meat part? I did 1lb but still 1/2 cup of Rao’s. Can you help? Hi Nicole, Unfortunately I don’t have the nutrition breakdown for just parts of the recipe. Any online calculator should work by just entering the ingredients there. We try not to eat so much ground beef. Can ground turkey breast be substituted and if so does it change the carbs? Hi Judy! Yes, you can easily use ground turkey. It shouldn’t change the carb count but it might have less fat. Thank you! How do you measure 4/21 of a cup? How ridiculous! Hi Chris, You must have changed the number of servings on the recipe card. Of course not very recipe can easily scale to any number of servings. The original recipe makes 7 1-cup servings and none of them are weird amounts that can’t be measured. I usually recommend just making the entire recipe and storing leftovers. Sometimes selecting a smaller or larger number of servings works out, but sometimes you end up with weird amounts like you discovered. I did as we are only 2 ! Going to try a smaller squash and just run with it ! Keep up the great work, much appreciated ! Another winner, we loved it! we used a small spaghetti squash & it was a lot for the two of us. So one squash, 2 halves, serves 8? Hi Carol, I usually get about seven servings from this recipe. Sorry, I cannot eat cheese or sugars so it’s had to find good recipes to suit but you do have some good recipes that I can alter a bit. I’m gluten-free. Hi Julie, sorry to hear you’re having a hard time finding recipes to suit your needs. 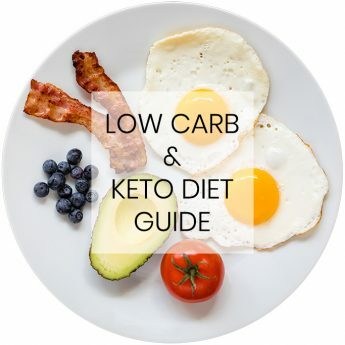 I have a keto & low carb support group on Facebook if you’re interested in some extra help. There are lots of supportive people there that like to share their recipes, tips, and tricks. It’s completely free and I hope you’ll join us! Is that serving size correct? seven servings out of one squash and 1/2 lb of ground beef. Sorry, just can’t see how you would serve seven. Hi Kim, yes, this recipe makes seven 1-cup servings. It is quite filling! If you don’t find it to be enough for you I would recommend adding some extra veggies to your meal.